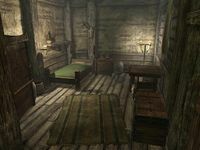 Aerin's House is the small two story house with a basement that is home of Aerin and Mjoll the Lioness in Riften. 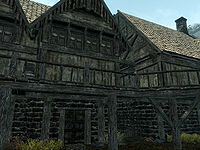 It is between Bolli's House and Snow-Shod Manor near the main entrance to Riften. The front door is generally adept locked. The first room is quite open. In the middle of the north wall is a long end table with a wooden bench to the right. The note, Request for Help!, is on the end table. Next to this, there is a bench. Against the east wall are staircases leading up to the top floor and down to the basement. Nearby the stairs are some barrels. Along the south wall is a long wooden dining table with chairs at either end of it, holding a baked potato, two salmon steaks, two portions of grilled leeks, some bread, an eidar cheese wedge, an apple pie, a boiled creme treat, a bulb of garlic and a bottle of wine. In the southwest corner there is a cooking pot on a stand. At the foot of the stairs is a food barrel. At the top of the stairs is landing with two doors. The first, on the right, is Aerin's and consists of a single owned bed in the northeast corner with a wall shelf above. On the shelf is an iron mace, a bottle of alto wine, and a bottle of wine. There is an end table beside the bed holding another bottle of wine. Against the west wall is a chair and tall wardrobe containing clothes. The other door off the landing leads to Mjoll's room. It consists of a single owned bed in the northwest corner with a wall shelf above holding a bottle of alto wine and an iron sword. Beside the bed is an end table holding a bottle of wine and a copy of Rising Threat, Vol. II. There is a small square table and chair against the east wall, with a tall wardrobe in the southeast corner and a wooden bench on the south wall, beside the door. Above the stairs are a couple more barrels of foodstuffs. There is also a cupboard in the room, opposite the door. At the bottom of the stairs down to the basement is a cupboard to the right of a doorway against the west wall. The cupboard holds a bottle of alto wine and two bottles of Nord mead. Under the stairs and along the south wall are several straw bales and food barrels. Through the doorway there are more food barrels on your right in the northeast corner. To the northwest is a set of shelves holding a bottle of Nord mead, a bottle of wine, a gourd, a cabbage, a bunch of elves ear, several Eidar cheese wheels and three potatoes, with a basket in front containing more potatoes. To the left of the shelves is a round wooden table holding a mead barrel. Still against the west wall, but in the southwest corner is another cupboard holding only clutter with an empty unlocked wooden chest in front, against the south wall. Finally to the left of the chest is another round wooden table holding a bottle of Nord mead, a food sack, an iron dagger and four loose septims. There is a Danger shadowmark to the left of the entrance door. Mjoll the Lioness lives here and she openly voices her disdain for the Thieves Guild, but is otherwise not a threat. If you haven't started the quest to assist Erandur, you will find a note from Madena on the end table in the first room. The note asks Mjoll to help with the nightmare problem in Dawnstar.